You won’t need an oven or any baking skills for this no-bake cheesecake! 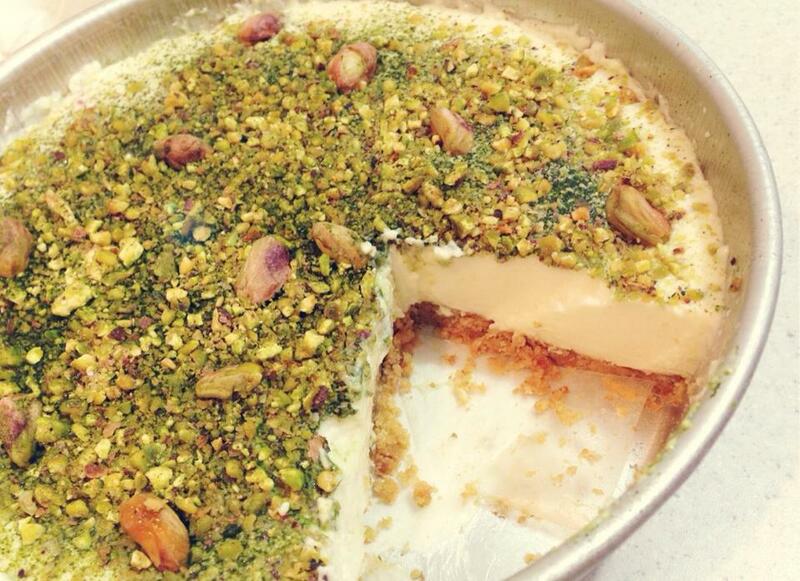 Really glad to have done this Matcha Pistachio Tofu Cheesecake recipe! Everyone loves the texture of the cake and the taste! The whole family enjoys it, even my extended relatives. Light, smooth and yummy! Feeling proud really! This is the first time I did it. I did certain changes to the original recipe and opted in for a healthier choice! Cause being healthy is in me! 🙂 And I do foresee myself doing this more often and serving to my friends too! I enjoy seeing people eating & enjoying it! Heh. 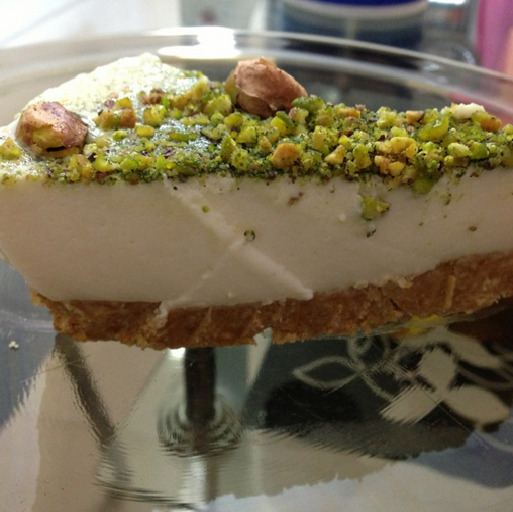 Tofu cheesecake is especially light on the taste buds and healthy as compared to conventional cheesecakes! Cause, personally I am not a sweet tooth person and I don’t fancy cakes. This time round, I’m in love! Light texture and extreme load of calcium in it! I enjoy it especially with my McVities biscuits! Line a removable base baking pan (8″ round size) with baking paper. Crush the digestive biscuits into fine crumbs and combine with melted butter. Press tightly into cake pan and leave baking pan in the freezer until required later. Dissolve and stir gelatin powder in warm water. Set aside for use later. Empty the rest of tofu cheesecake filling ingredients into an electrix mixer, and mix until well combined, around 1 minute. Add the dissolved gelatin at the end, stirring thoroughly. Remove baking pan from the freezer. 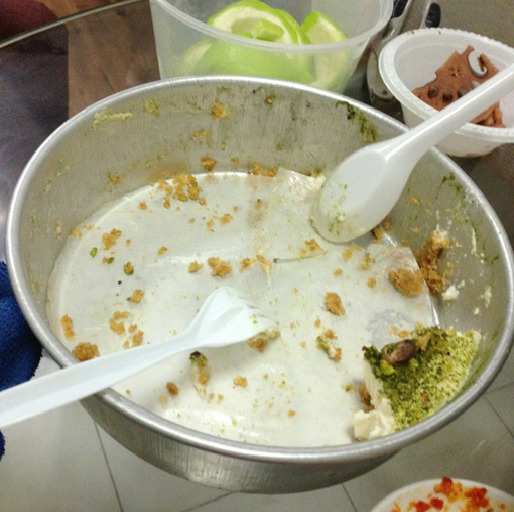 Pour your tofu cheesecake mixture into the pan. 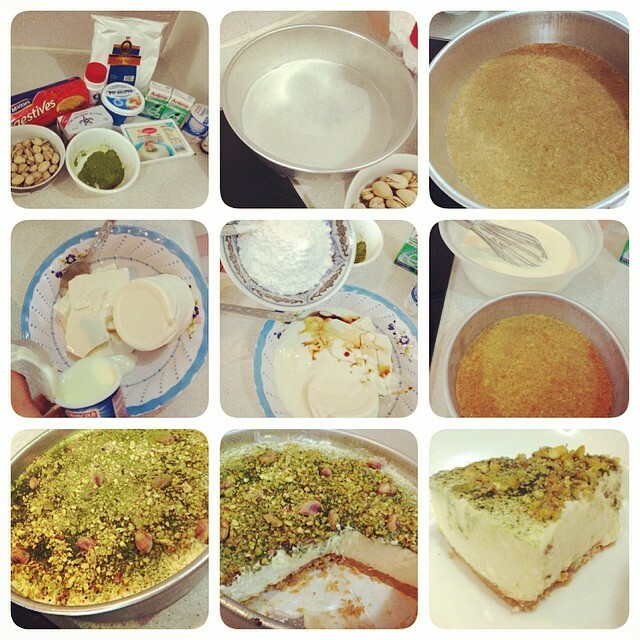 Sprinkle the top generously with matcha powder and pistachios. Chill in the fridge for at least 4 hours or until firm to the touch, when it doesn’t wobble too much when you shake the pan. I think this is one of my favourite cake ever! Mixing it with matcha & pistachios are really optional. You can mix it with passion fruit juice too! It’s really up to you. The evidence of clearance!! Haha! I just made it yesterday, so fast! Purposely left a small bit to show that it’s my cake! Happy and satisfied that people around do appreciate and love what I do for them. Probably, this is the best way for me to show how much I love them. Other than baking, I enjoy cooking too! Made dinner for the family & Wayne. 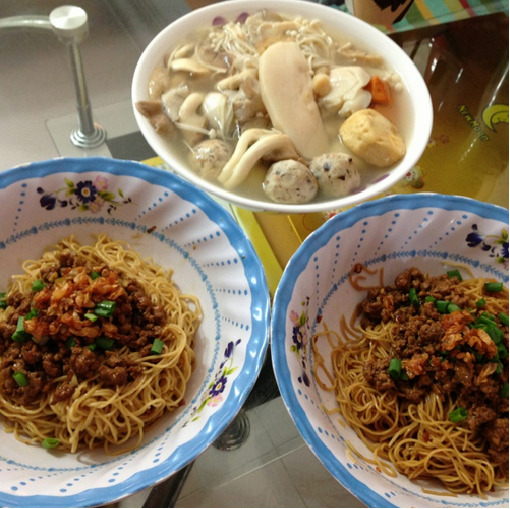 Trying out the new Hong Kong noodles with a fusion of Malaysian minced pork style! I think Wayne is a lucky man! Thou he is a better cook than me, I tend to spent more time on cooking than him. I even told him I wanted to be a housewife! Heh! Just saying. Even today’s breakfast. 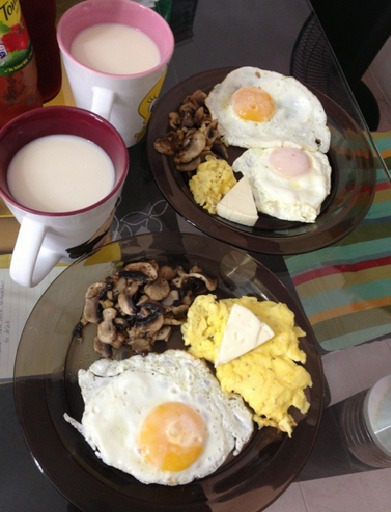 Healthy organic milk, button mushrooms, cheese and eggs! They belong to the weekends, aren’t they? In house brunch isn’t a bad idea too, save money and can add a lot more ingredients whenever I want! Yay! Refusing to spent my money on cafes, cause it is tad too much of expenses! With an insatiable hunger to travel, love mornings, love adventurous challenges, love the nature. Passionate about health and fitness. Yay, it’s finally here! My personalized badge of honour to commemorate the amazing journey of breastfeeding my little one. It’s a tough but yet the most fulfilling journey I will not trade with anything. Time is fleeting and these moments are so precious. If he wants me close I’m going to give him that. Because one day, not even that far in future these moments will just be memories. When you've spent every waking (and sleeping) moment with a human being for three months and seven days, they become a part of you. And suddenly, you couldn't dream of having it any other way.